The movie particularly draws out plot points and characterizations from Hammett’s The Glass Key and Red Harvest, both centered around a shrewd tough guy during a Prohibition-era mob war. 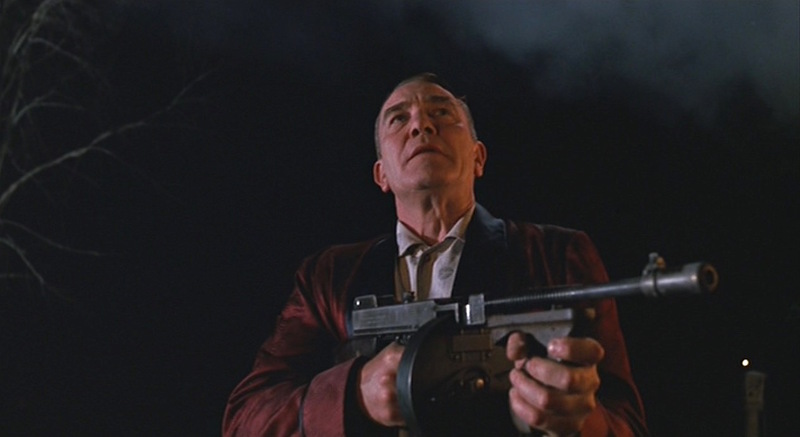 The Glass Key has been specifically cited as an influence on Miller’s Crossing with Leo and his pragmatic protégé Tom Reagan clearly modeled after the book’s Paul Madvig and Ned Beaumont, respectively. Madvig, a crooked big shot, relies on Ned to do his thinking for him without realizing that the two men are also sharing a mutual love interest. 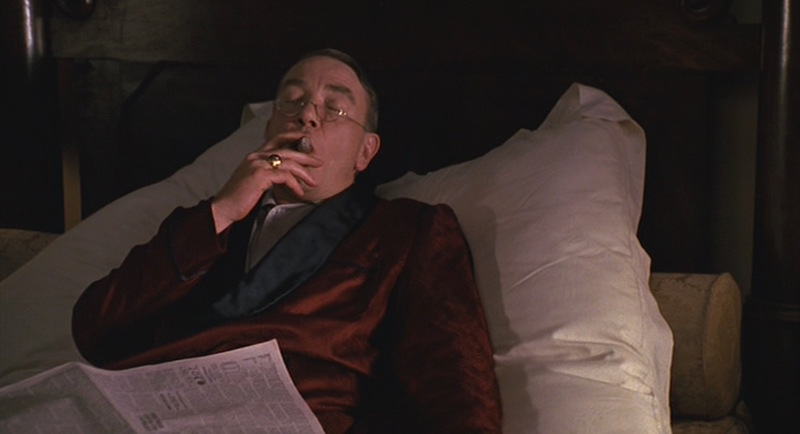 The Coen brothers originally imagined Trey Wilson for the Madvig-esque role of Leo O’Bannon, but Wilson’s death just before production brought Albert Finney into the role, his first major film in three years. Who else but Finney could have delivered “Jesus, Tom” with so much earnest conviction each time? As the boss of two warring mobs in the film’s unnamed setting, Leo becomes targeted for an assassination attempt. The sequence proves that while brains might not be his strong suit, Leo’s got plenty of chutzpah to match his excessive hair tonic. Toss in a stirring tenor rendition of “Danny Boy”, a tommy gun with a seemingly bottomless ammunition capacity, and a well-deserved cigar and a classic scene was made. Leo’s status as a big man in town is evident by elegant loungewear. His red printed silk dressing gown has black satin trim, including the black shawl lapels. The robe has three pockets, including two slanted hand pockets with black satin jetting. Leo wasn’t preparing for a gun battle when he went to bed that night, but – if anything – he reinforces the Boy Scouts’ maxim to “Be Prepared”. Before the battle begins, Leo places his now-extinguished cigar in the patch pocket over his left breast, which has a thin strip of black silk about an inch down from the opening. 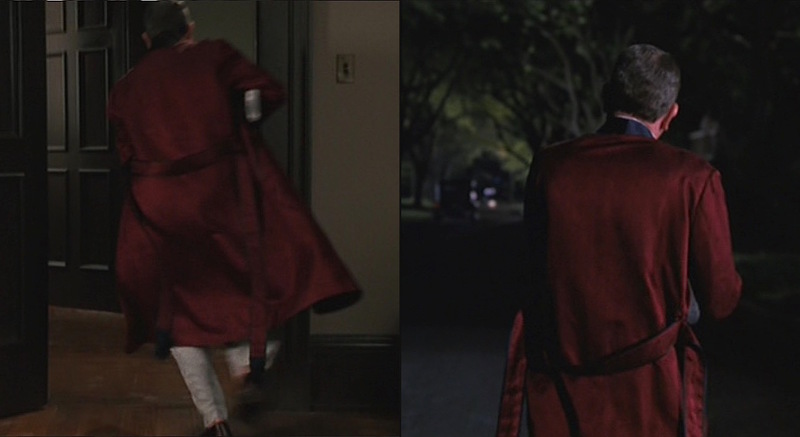 Although it appears solid red in wider shots, the robe’s silk is actually two printed tones of red in a swirly Deco-style design. Even when settling in for a night of slumber, Leo keeps his hair immaculate. The robe ties around the waist with a matching red printed silk belt with black satin-trimmed edges and black tips. Underneath, Leo wears pale blue cotton pajamas with thin white piping on the edges. The untucked pajama shirt has four clear plastic buttons, including a slightly smaller button that closes at the top under the narrow, rounded collar. There are two white-piped patch pockets on the lower portion – one over each hip. The pajamas’ simple trousers have plain bottoms with no cuffs. Expecting trouble, Leo casually slips into his black Prince Albert house shoes (hey – “Albert!”) Like classic Albert slippers, they have velvet uppers, leather soles, and quilted inner lining – black in this case, although red is also common. The vamp is decorated with a gold embroidered crown and a brown leather strip across the top. The dark brown hard leather soles come in handy when Leo finds himself tumbling outside. Albert puts on his Albert slippers. 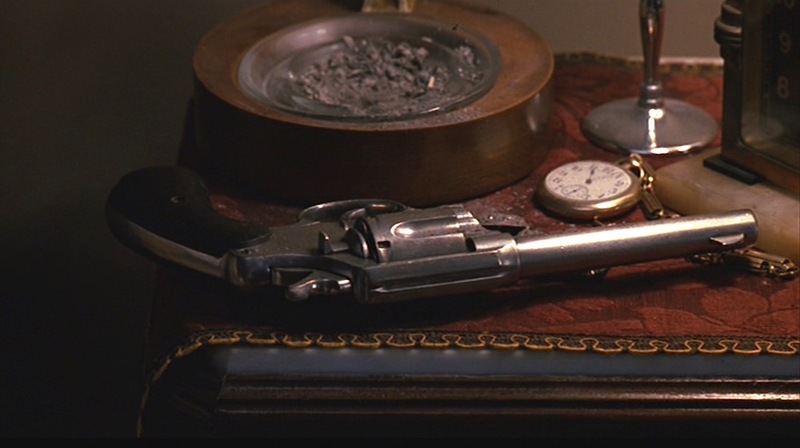 Leo wears a large gold ring on the third finger of his right hand, flashing the big green stone setting when he firing a revolver at the hitmen from under his bed. Leo relaxes comfortably at the intersection of leisure and luxury. Since he was reading his newspaper, Leo also sports a pair of reading glasses with clear half-moon lenses and thin gold frames and arms. From the beautifully atmospheric scores contributed by frequent collaborator Carter Burwell to O Brother Where Art Thou‘s Soggy Bottom Boys cutting their recording of “Man of Constant Sorrow” and The Dude’s character-defining music taste in The Big Lebowski, the Coen brothers have always been masters of using music to heighten the scene. John McCormack was one of the most celebrated Irish tenors of his time and hearing his remarkable renditions of songs like “Danny Boy” and “When You and I Were Young, Maggie” leave no question as to why. 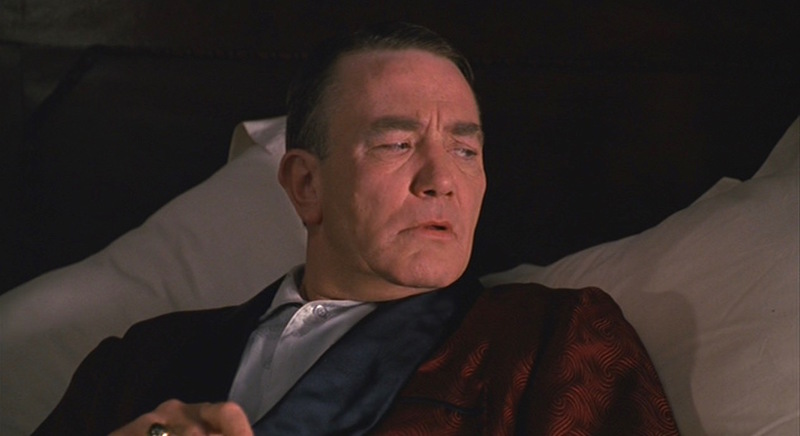 To elevate the scene depicting Leo’s assassination attempt from badass to cinematic perfection, the Coens recruited Frank Patterson, known as “Ireland’s Golden Tenor” and described by Taoiseach John Bruton as having “the purest voice of his generation”, to deliver a stirring performance of that most Irish of ballads for the sequence. The Coens directed Patterson’s performance to be precisely timed with the events on screen, following Leo as his night rapidly shifts from relaxation, tension, action, and – finally – sweet victory. 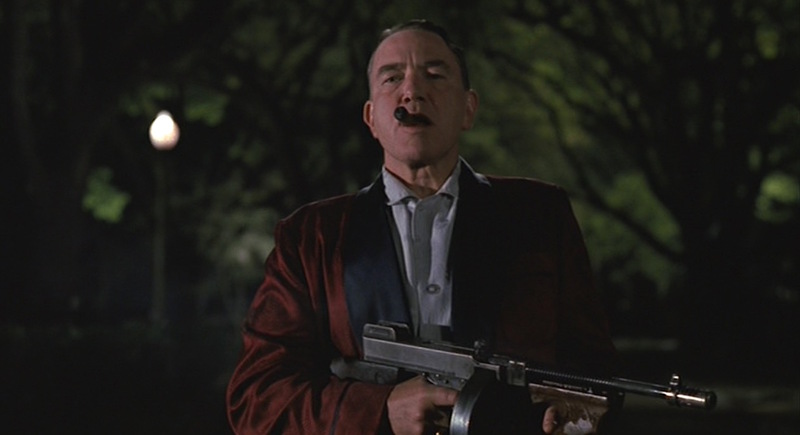 Miller’s Crossing delivers one of the few cases in the post-political correctness world where smoking is actually seen to save someone’s life. If Dana Cudahy hadn’t been smoking his Fatima cigarettes downstairs when he was killed, the cigarette would’ve never lit up the newspaper; the newspaper smoke rising through the floorboards is what alerted Leo to potential danger. And, of course, if Leo hadn’t been awake smoking his pre-bed cigar, he wouldn’t have even seen the newspaper’s smoke in the first place. Although typically a practical dresser for his everyday outfits, Leo allows his attire to reflect the hedonistic excesses of gangsterdom when relaxing around his home… and why shouldn’t he? …as Terry McGill proudly tells Tom in the aftermath of the attempted hit. 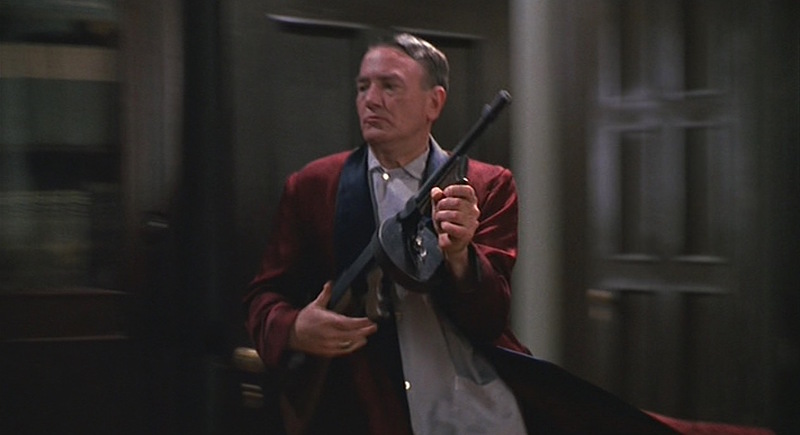 And while Leo does display a fine – if excessive – shooting technique when mowing down the mob hitmen with one of their own Thompson M1928 submachine guns, he must also be something of a magician to keep it firing that long without reloading. Leo takes out two hitmen and a car full of backup assassins all with a single drum of ammunition. 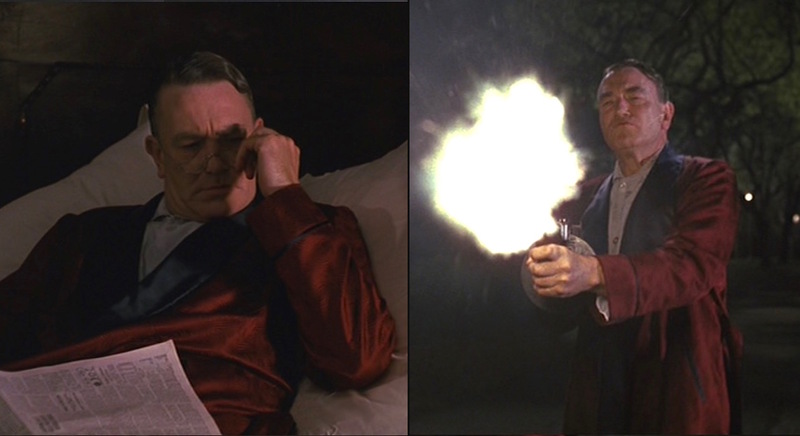 While Miller’s Crossing certainly aims to explot the genre’s propensity for exaggeration (after all, do that many people ask “What’s the rumpus?” in real life? ), it’s worth noting that even a 100-round drum of ammunition would have needed to be reloaded five more times after the first magazine was emptied. 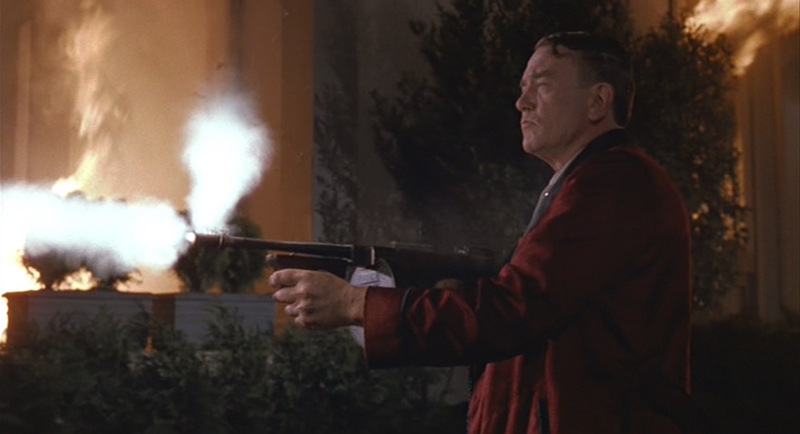 However, entertainment ought to trump realism for this scene, especially for the brief bit where Leo guns down a hitman from behind, causing the dead killer’s finger to pull the trigger on his own Chicago typewriter and fire wildly, even into his own feet. Leo only gave himself a fighting chance by keeping his own firearm, a Colt New Service revolver, easily accessible on his nightstand. After the gunmen burst into his room, Leo grabs the New Service from his nightstand and dashes under the bed. Leo eyes his Colt New Service moments before needing to grab it. 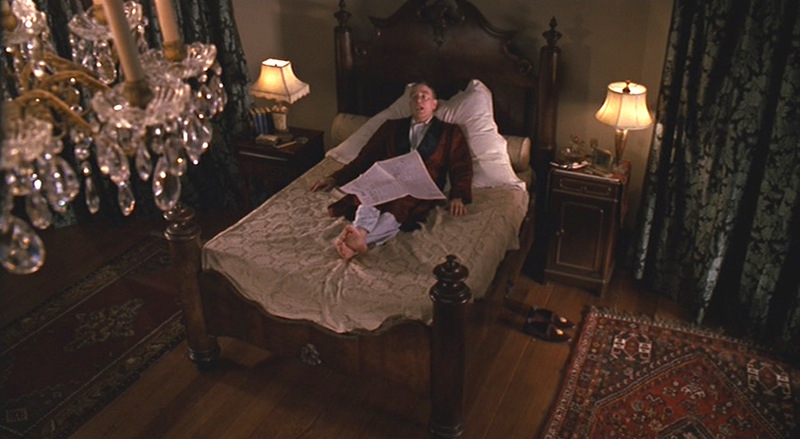 In a questionable maneuver that seals their fate, the gunmen synchronize firing up the sides of the bed, allowing Leo just enough time to fire a .45 round from his New Service into a hitman’s foot. When the hitman drops, Leo finishes him off with a second round to the head. 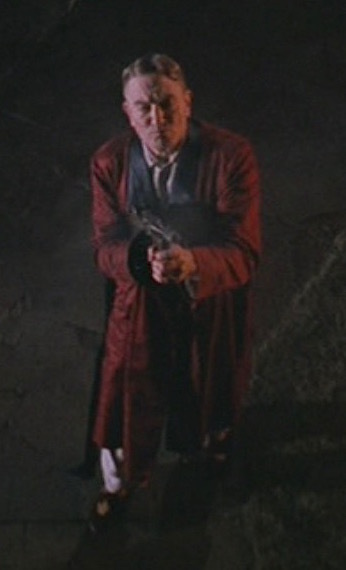 Leo then picks up the dead man’s tommy gun and is better armed for the next stage of battle. Miller’s Crossing never explicitly identifies the time or place of its setting, barely even implying that we’re seeing an eastern U.S. city sometime in the late 1920s. 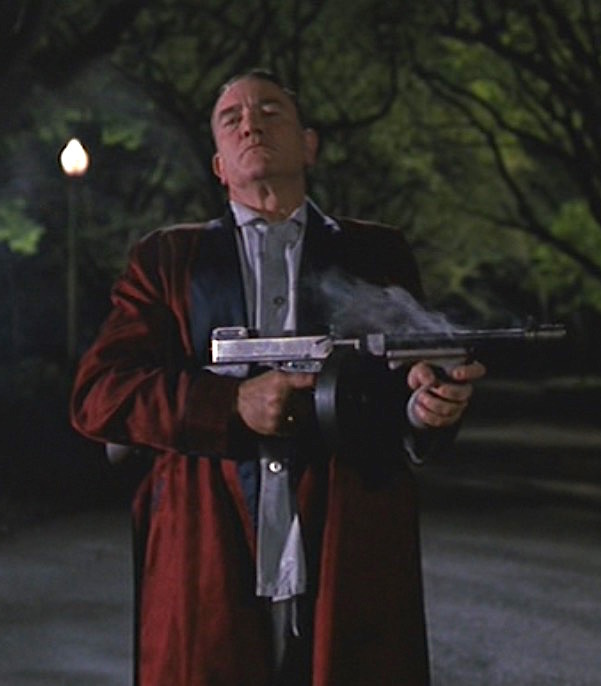 It was filmed in New Orleans mostly to take advantage of the city’s old-fashioned and unchanged architecture from the era; Ethan Coen even stated that “New Orleans is sort of a depressed city,” inspiring its use to set the tone of Miller’s Crossing… a “depression” that was used two decades later to convert the city into 2008 Boston for Killing Them Softly. Context clues, however, tell us that it was likely meant to be upstate New York sometime in the fall of 1929. Although the town certainly evokes thoughts of Al Capone’s war-torn Cicero, a suburb of Chicago, Tom’s mentions of the Palisades and Niagara Falls as relatively nearby spots to quickly lam out imply a setting in New York state. The experts at IMDb have tried to use Johnny Casper’s office calendar – which indicates a January where the 1st fell on a Saturday – to determine that the year is likely 1927. However, Johnny Casper doesn’t strike me as the type to update his calendar often, and the “Lars Thorvald” fight poster promotes a date in the fall of 1929. Casper even appears to date his check to Tom for December 2, 1929. The recording of “Decatur Street Tutti” by Jabbo Smith’s Rhythm Aces – which we hear in Verna’s apartment – was recorded on April 4, 1929… a recording that would’ve been released shortly after and thus, also available by the fall of 1929. And – HREY! 🤔 – someone made a cool Pin that reflects this scene. If I had a Pinterest, I would re-pin it myself.